Get ready to enjoy a seriously epic day at the Erie Canal as you and your group learn the history of the Locks, take a cruise down the Canal, and get to know the local land a little bit better! Erie Canal Discovery Center - Welcome to the Erie Canal Discovery Center, a quaint New York museum located in Lockport featuring various art and information on the history of the Erie Canal. This 1843 canal stone building sits right next to the historic Flight of Five, as well as Locks 34 and 35. Enjoy several different interactive displays while here, the first floor of the museum holding the official City of Lockport Visitor Center, as well as the extremely fun Lock, Stock, and Barrel Museum Shop. Spend some time on one of the most popular exhibits inside the walls of the museum, the 15-minute feature film about the building and deep cutting of the locks, as well as the Flight of Five. This film, “Gateways East and West," allows you to board a packet boat halfway through the presentation of a simulated night-time ride up through one of the 1820s locks! After you’ve learned all you can in the museum head out and actually walk through the monumental engineering feat that is the locks! Locks and Canal Street - Next stop, the Locks themselves, as you and your group explore a small portion of the over 500 miles of navigable waterway containing access to over 200 unique communities across the canal. See all the history and culture in person and sight-see the area, fish, boat, bike, or hike among the countless bridges and byways. Grab a quick, yet delicious, treat from Lake Effect Artisan Ice Cream, the local sweet shop with the most unique and tasty hand-made scoops! After you’ve seen all you can of the Locks' head over to Canal Street in Lockport to explore the Lockport Community Market. This seasonal market takes place between July and October, with October holding the locally popular Locktoberfest. At the market, you and your group will be able to explore historic Canal Street while also seeing what the best local farmers, vendors, and crafters have to share. This is a great way to see the local culture of Lockport, as well as pick up some seriously unique produce, spirits, and specialty foods. 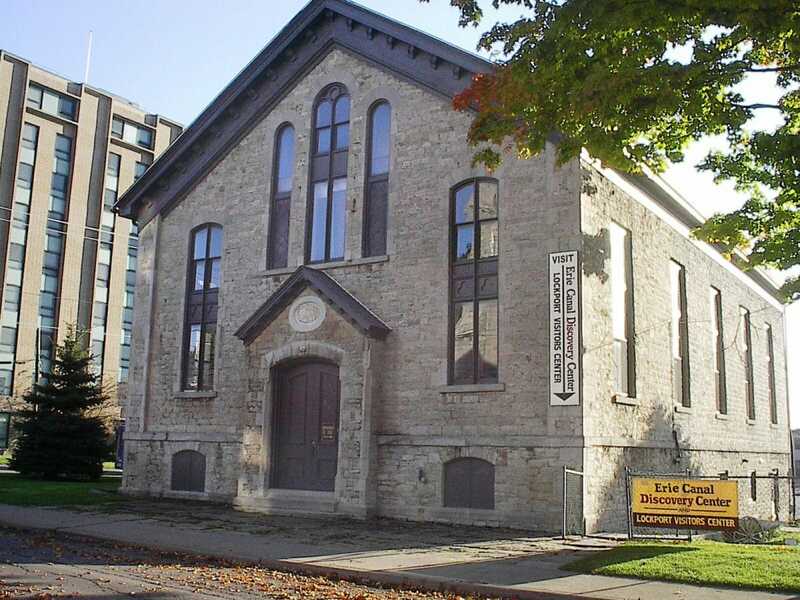 History Center of Niagara County - Get ready for some more truly interesting Erie Canal history as you and your group head over to the History Center of Niagara County, otherwise known as the Niagara County Historical Society Headquarters. The entire complex in total holds five buildings, including the brick home, Washington Hunt Law Office, Pioneer, and Transportation Building, the Barn, and the Kandt House. This conglomerate of buildings, and the historical society as a whole work well to give your group a little glimpse of what life was like over the last 175 years along the Erie Canal. The Outwater House, or main historical site here, is a marvelous Italianate-style home built in 1863 that holds four permanent room exhibits at all times, as well as two special exhibits that change regularly. At the current time, you can see the exhibit “Remember Me: A Ceramic Story of Niagara County,” as well as the permanent Victorian Parlor, Old Pantry, Civil War Room, and Old Toy Room! Lockport Locks and Erie Cruise - What better way to end your day in the Erie Canal than with a famous Lockport Locks and Erie Canal Cruise! This unique two-hour cruise allows guests to enjoy the sensation of being raised 49 feet on the Niagara Escarpment, the same escarpment you will encounter at the Falls. Learn all about the hand dug a canal connecting the Hudson with the Niagara River along the 363 mile Grand Old Erie, as well as the original 83 stone locks that are today only 35. Pass under bridges, see water cascades of the famous Flight of Five locks, travel through solid walls of rock cut, and even spot local canal life, the views showing you some of the most beautiful fruit trees, wildflowers, and fall rustic colors! After your licensed captain finishes describing all the interesting architecture, sites, and folklore along your canal path you can come back to shore and hit up the Canalside Cafe and Pub or nautical gift shop!